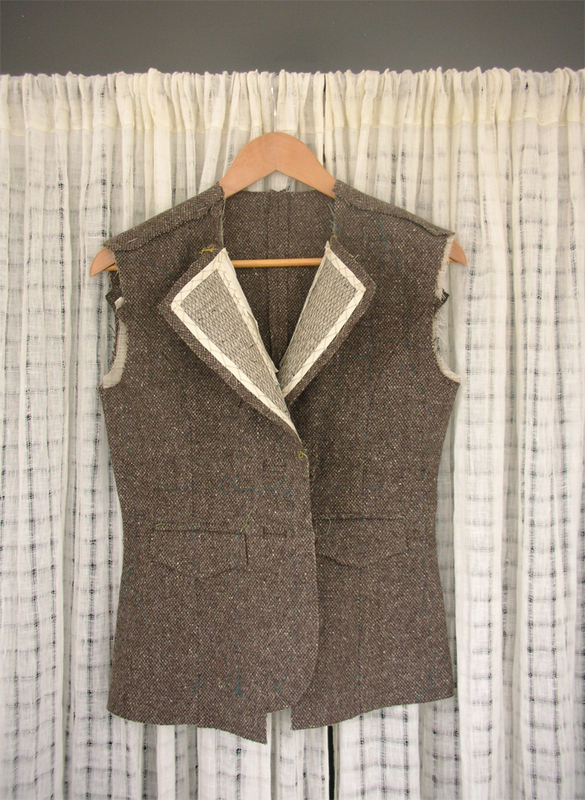 One of my classes this semester is all about a tailored jacket – for the entire semester we are handcrafting a tailored women’s blazer. 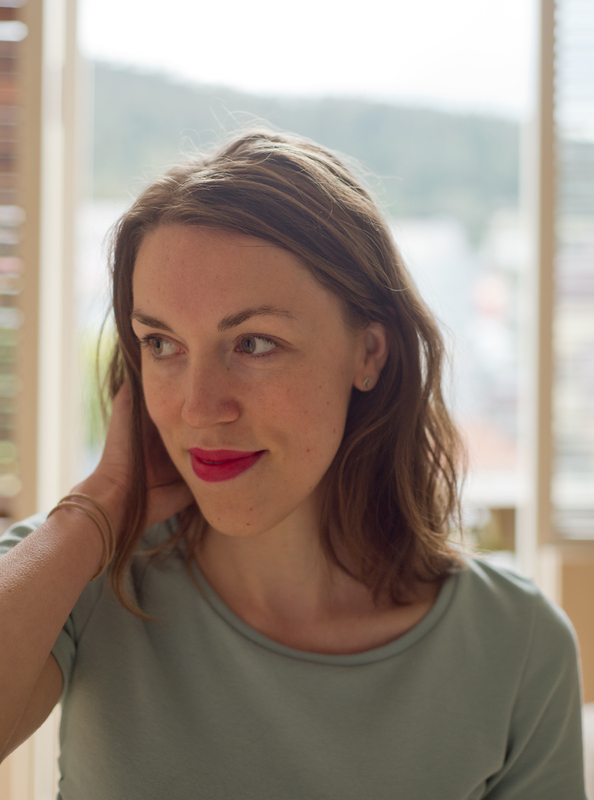 I adore this class more than I can say; it’s handsewing, nit-picky things, wool, and traditional techniques. Bliss! This is how far we’ve gotten. After sewing all the sides of the jacket, we practiced sewing welt and flap pockets before we made them in our actual jacket. I made up my own shape for the flap, and lined it with the silk I am planning on using for the lining. 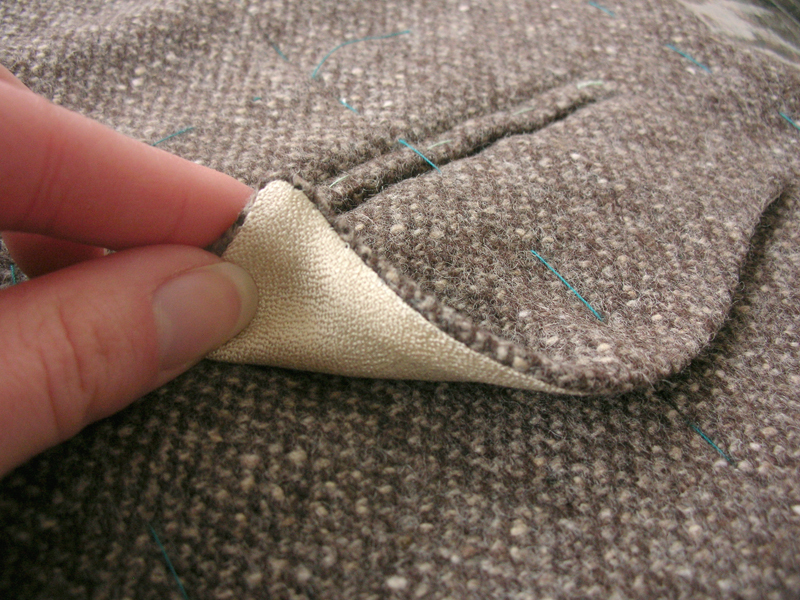 The bound buttonholes are more or less miniature welt pockets, made to fit whatever size buttons you plan to use. This tweedy wool has been absolutely fantastic to work with. It doesn’t ravel, it presses gorgeously and neatly, and it has such nice drape to it. I’m excited about this fabric! To me it had a bit of a British aristocracy/horseriding feel to it (must be the tweed), and I’m trying to further that through little details like the pocket placement, perhaps leather patches on the elbows… We’ll see. After the pockets were all in place, we went on to the inside front of the jacket. 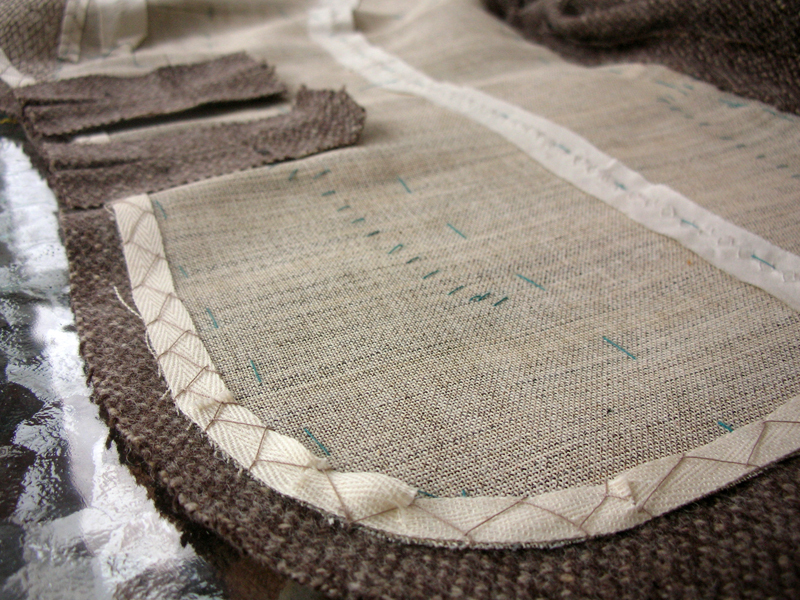 In proper tailoring, horsehair canvas is added to the inside of the front panels to add stability and body. First it needs to be basted on to the wool, both so it doesn’t shift while working on the next steps, but also to make absolutely sure that it lies flat and smooth. 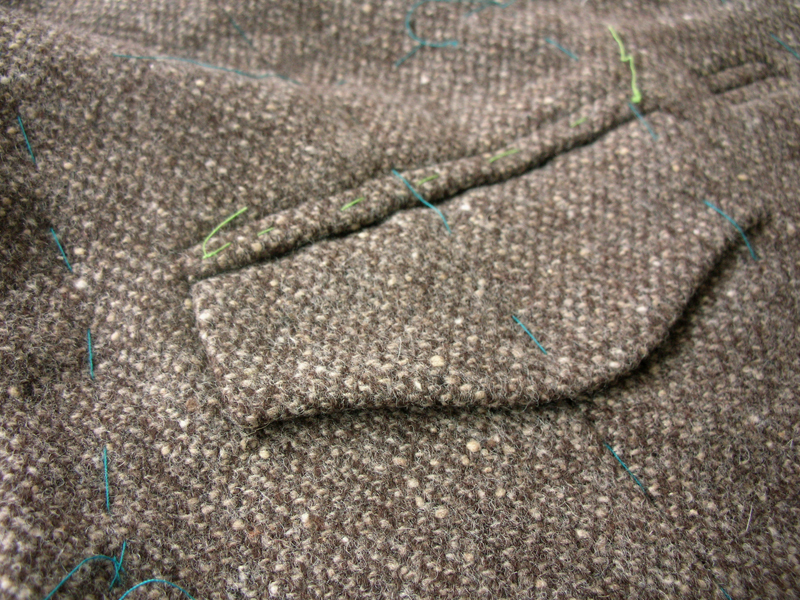 Next the canvas is sewed down; to the side seam allowance, to the edges of the pocket, and to the lapel. On the lapel it is fastened with what is called padstitching, rows and rows of diagonal stitches that kind of interweave. This is done not only to secure the horsehair canvas to the wool, but also to shape the lapel to make it curve and roll over. The innards of the jacket. Looking at the big version of this image, you can kind of make out where the canvas has been stitched to the sides of the pockets. Also, those long lines of basting in teal-colored thread is where the canvas has been secured to the wool – for now. Next we trimmed away the excess horsehair canvas so it stopped right at the seam allowance of the wool, and stitched twill tape along the edge to make it nice and crisp. 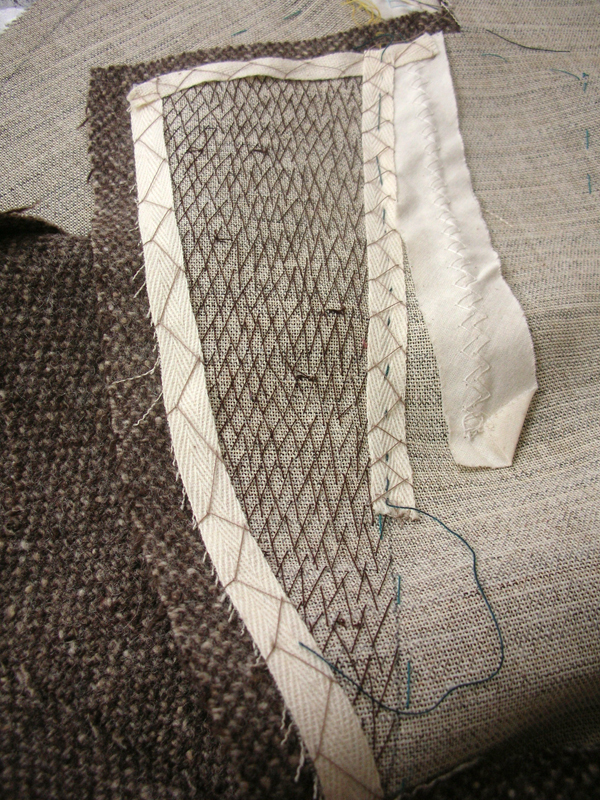 This way, the jacket will have nicely defined edges, with the twill tape nestled up right next to the seam. 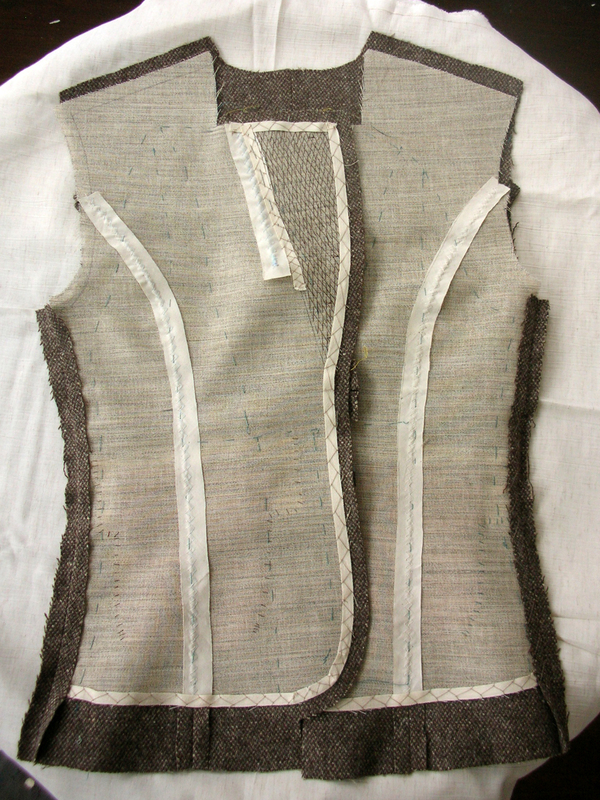 There is obviously much left to be done on this jacket – the lapels, setting in sleeves, buttonholes and closure on the sleeves, and finally – lining. I’ll be excited to see this jacket evolve! I will recommend to you the sewing book that was my textbook in school for my tailoring class, which is “Classic Tailoring Techniques: A Construction Guide for Women’s Wear” by Roberto Cabrera and Patricia Flaherty Meyers. I think “A Guide to Fashion Sewing” by Connie Amaden-Crawford is a better book to help with the complete picture of how to put together garments, including tailored jackets, since the “Classic Tailoring Techniques” goes into details, and offers so many options and variations that it is definitely not a step-by-step guide. Additionally, Sherry at Pattern, Scissors, Cloth has an excellent and thorough sew-along for a ready-to-wear style tailored jacket. I am just planning to do a tailored jacket for a friend and find ur photos very inspiring! All best! Can’t wait for you to show me your new tricks! !